It seems to be a good goal to remove the "I" from my words and use the word, "We," often so that WE can all dream together. What good fun! It is my belief that we can get rich together, and I, alone, will never be rich. Only by removing the I, the ME, and adopting the WE approach do have a chance of wealth. We can all be rich in time and friends, and then we can share that goal, the idea that time and friends are more important than money. I consider myself a nerd, but not part of the herd of nerds that heard that Bill Gates was a jerk, then told everyone. I am not part of the anti-Microsoft, anti-Bill Gates, or even the more cliché group, the anti-George W. Bush group. We could all get together and create the tribe of people who think Bill Gates is a jerk. I feel quite certain there exist a few groups that want to castrate George W. Bush. As a world traveler, I was grateful that the liberal group got Obama elected. The Europeans found it fashionable to complain about President Bush, and the bandwagon was out of control, over-populated; the group-think seemed to dominate. It is nice to travel the world and not hear complaints, and my opinion and respect for leaders (or not) is not going to change the world. In way, the more enemies a man has, the greater the man; it is the power of his enemies that defines ones greatness. And it is the bandwagons we refuse to ride that allow us to rise above our petty day-to-day aspirations and dream. I am a big fan of "Ted Talks" on YouTube.com and recommend we all get lost in them together, with the celebration of ideas. Maybe we then have a chance of going to Heaven and not living in Hell on Earth. Well, there is one man, by the name of Ernesto Sirolli, who presented on "Ted Talks" and who is trying to change my life. I feel he talks to me about US, about how WE can change the world. That is the idea: WE can change the world, and I cannot. People often believe I hate NGO's, non-governmental organizations. This is not true! In all reality, they have the money to change our world, and we need to work together to watch them and work with them to bring about real change. What they do in my name as USAID is about WE, not ME. 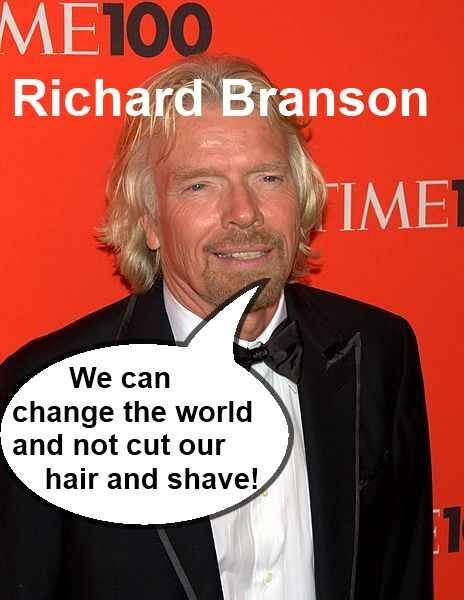 Richard Branson is one of the most important people on the planet, as well as Bill Gates and understand (Please relax!) that George W. Bush also changed the world. I admire these three people. I am envious. They understand how to put the power of WE together and remove the I. "Hobo Traveler" is about WE. And we, me, and Andrew, boy genius, talk daily about how to remove the Andy from this travel blog. It seems funny when people say to me, “Andy, why do you write about how to travel?” And this is not my first goal; my first goal is to talk about how we can have free time to do whatever we want to do together. And for me, what I do is travel. And it is not for everyone; you can find your own path. You take one path, I take another, and we all meet together to share a cup of coffee, a beer or a dream. Life is a WE thing, not a ME thing. When WE are happy, all my friends will be able to come out and play together. Please do not get this wrong: We can all be idiots together also, but we all need to be on the same page and not lose the plot.